Asthmatic manifestations marked by wheezing or labored breathing, bronchial spasm, coughing and productive phlegm. Useful for asthma with internal phlegm heat that is aggravated by pathogenic wind. 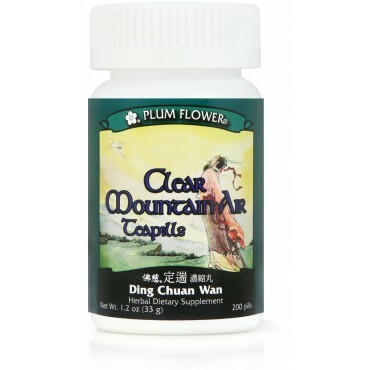 Applicable in bronchitis and emphysema are some of the imbalances satisfied clients have used this product for. Ginkgo biloba seed, Morus alba root-bark, Platycodon grandiflorum root, Perilla frutescens seed, Prunus armeniaca seed, Scutellaria baicalensis root, Pinellia ternata rhizome, Glycyrrhiza uralensis root, Stemona sessilifolia root, Aster tataricus root. - Bai guo, Sang bai pi, Jie geng, Zi su zi, Xing ren, Huang qin, Ban xia, Gan cao, Bai bu, Zi wan. Contraindicated for complaints due to wind-cold without heat signs. Use with caution in cases of chronic asthma with Qi deficiency. Contains tree nuts.